To say Preston doesn’t like change would be a major understatement. When he first enrolled in Project SEARCH, he refused to come into the classroom and meet Goodwill’s Skills Trainer and the teacher from the North Kansas City school district. Project SEARCH is a partnership between Goodwill, North Kansas City School District, Children’s Mercy, Vocational Rehabilitation Services, Center for Human Services and Truman Medical Center. Project SEARCH is a high school transition program that provides real-life work experience to help youth with significant disabilities make successful transitions from school to adult life. 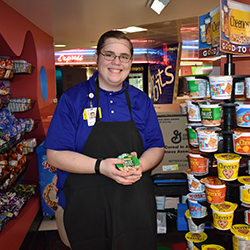 Students participate in three 10-week internship rotations where they learn job skills and receive on-the-job training. Through patience and perseverance they convinced Preston to participate in his first internship rotation with Ronald McDonald house. He loved it so much he didn’t want to switch when it was time for the second internship rotation. He received high praise from the people he worked with. But Preston was a great employee with a lot of potential and his Goodwill Skills Trainer was not ready to give up. He was eventually convinced to move to an internship in Food Service and he loved that too! And again, his supervisors thought he was an excellent employee. There was one more big change waiting for Preston. He was hired by Children’s Mercy Hospital! He’s been working in their patient food service for over six months. I think its safe to say he plans on staying.